Dollops of Diane: Hangman Fun! Isabelle had a gift card burning a hole in her pocket so we headed out yesterday for her to spend it. 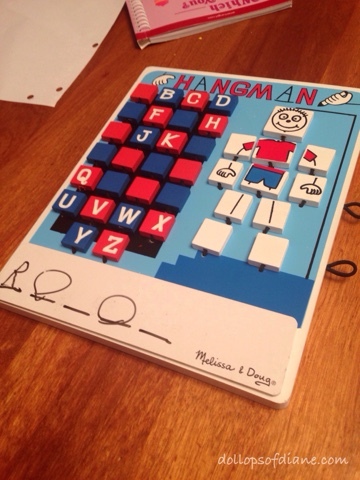 She picked out this super cute hangman game which I had never seen before. Let me tell you, this was well worth the money (which I didn't even have to spend!) since the kids played it ALL day. Then when my husband got home we played together as a family. First thing this morning the kids were back at it. We picked it up at the store but (like most things) you can find it cheaper on Amazon. Click HERE to check it out. I bet you'll love it, too!